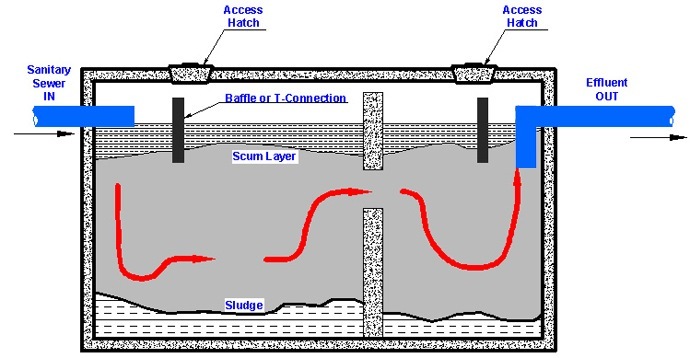 This is a general layout of a septic tank showing the direction of the flow. The SANS 10400-Part Q deals with the healthy handling and treatment of effluent when there is no water borne sewage system available in a particular area. Health is the major factor when it comes to effluent and any pathogens, pollutants or contaminants must not affect the user of any sanitary waste means of disposal. The local authority has the over riding say on what is and what is not permitted in any area over which it has jurisdriction. The Part Q refers to all the parts of the system that could be used from Closets, Chemical toilets to VIP toilets (Ventilated improved pit toilets). 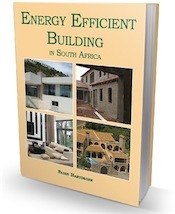 The construction guidelines are specific as to size and location and must minimise odours and the attraction of flies. Conservancy tanks have become the rule in many municipalities and there are specific guidelines on the installation and siting. Firstly a conservancy tank must be built or a precast one can be bought. Then it must be sited beneath ground where the Building Regulations and local authority require it to be sited. You must then organise with your local authority or an authorised provider to pump the tank out on a regular basis. This is an interesting one because the National Building Regulations no longer cover pit latrines… presumably because they are totally unacceptable in any circumstance. Even the definition has been deleted from the Act. I doubt that there is any type of standard for “improvement”; they probably have to be filled in and a sewage system of some sort constructed! I also did a search on the SABS web site for “latrine” and there is nothing. You could phone the Plumbing Institute for advice… IOPSA See http://www.iopsa.org.za/ for contact details.